This program has gradually lost the ability to connect to websites. I have no idea why. The program is no longer useful. This program will let you quickly check if there are new versions of any of your apps. Read the precis to understand how it works. Or just click Check For New Versions to see if there are any new versions for any of the default set of applications. The results are summarised at the utilities entry in plain HTML (Hypertext Markup Language). I update the code for Vercheck frequently, sometimes several times a day. The means the downloaded version will soon be out of date. Download it primarily if you want to study or modify it yourself. The easiest way to use it to monitor the standard list of application or your own applications is to run it as an Applet getting its jar each time from the http://mindprod.com/applet directory. This program is an implementation of the VerCheck student project outline. Reading it will help you understand how this program works. If you are a Java programmer curious how the program works, you can either download the source or view source code in JDisplay format. If you install VerCheck as an application rather then running it without installing as as Applet, when you add apps by configuring defaults.csv, make sure you prepend the match string with regex: when your match string is a regex. Could not contact website, or possibly the page is missing. Could indicate a version change. Version has recently changed. A new version is available. The marker is out of date. The sound like a golf ball falling into a hole is what VerCheck makes when it has finished checking all the applications and it is saving the results in the registry. For this Applet hybrid to work, you must click grant/accept/always run on this site/I accept the risk to give it permission to probe various websites to see if new versions of software are available. If you refuse to grant permission, the program may crash with an inscrutable stack dump on the console complaining about AccessController.checkPermission. for the current version of VerCheck Version Change Detector. Checks applications to see if new versions are available. 3.9MB zip for VerCheck Version Change Detector Java source, compiled class files, jar and documentation to run on your own machine either as an application or an Applet. access vercheck source in repository with [Tortoise] Subversion client on wush.net/svn/mindprod/com/mindprod/vercheck/. download ASP PAD XML program description for the current version of VerCheck Version Change Detector. 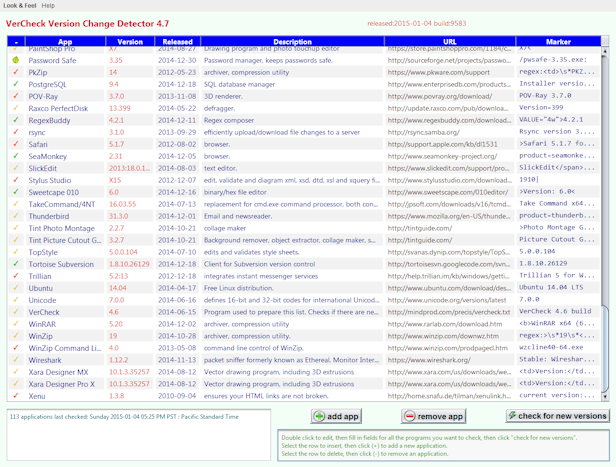 VerCheck Version Change Detector is free. Full source included. You may even include the source code, modified or unmodified in free/commercial open source/proprietary programs that you write and distribute. Non-military use only.